Pattern from my stash dated 1968!! Yipes, I really must be getting old. Can't remember which version or what material I used back then. But I bought a cute cotton/lycra print at The Fabric Store in Christchurch that was mostly purple (I never wear purple) and decided to use it on this skirt pattern. I made View 5, 25 1/2 inch waist - same size I made in '68! I used a 0.5mmL, 2.5W zigzag fro the seams and then finished them with a 3-thread serge on my overlocker. Although not in the instructions, I underlined the waistline facing. 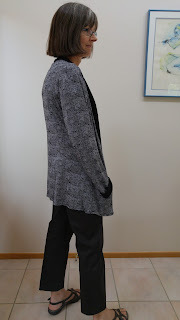 The pattern says to sew the side opening edges of the facing before putting in the zipper but in retrospect, it would have been better to wait til I put in the zipper to do it. 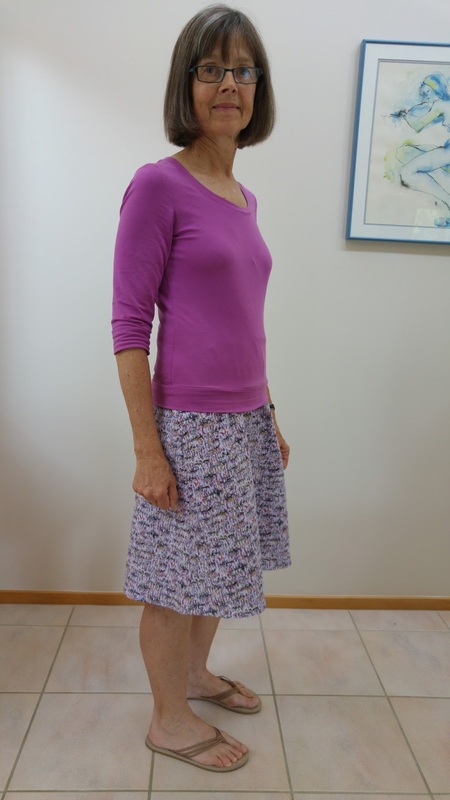 I then bought some 'First Class' viscose/spandex from Harald's Fabrics in Christchurch and made a Sewaholic Renfrew top View A but with 3/4 sleeves to go with the skirt. Of course, the best colour I could find was purple - so now I truly do wear purple! I prewashed the fabric in a cold hand wash. 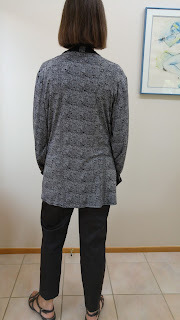 I used a Janome blue tip needle and tried the Sewaholic's recommendation of a zigzag stitch (1mmW, 2.5mmL) and then overlocked the edges on my Brother overlocker using a ballpoint 70 needle. I'm not pear shaped (I'm 8 bust, 6 waist, 2 hip per pattern!) but I made B8, W8, H6 and it worked fine. I'm very short waisted so I took out 1 inch at the waist and shortened the hem by 1 1/2 inches (measuring from the size 2 line). I sewed 1/4 inch staytape onto the back seam allowances at the shoulder with just a little going into the actual seam. For the ZZ around the neck, I used 4W, 2L. Here's how it turned out. I love the top but any wrinkles in the skirt show through the shirt. The skirt pattern called for twill tape on the waist, which I used, but I don't really like it - feels too tight when I sit down. One of the threads has popped already on the waistband of the top so I guess I should have either used a shorter stitch length or just used the overlocker for the seams. solid black on the other. I prewashed the fabric on cold in the washing machine. I used a 75 stretch needle on my Janome sewing machine and Brother overlocker. I followed the directions as printed, shortened the bodice by 3/4 inch and ended up with a dressing gown (aka bathrobe). Should have made a small I guess! So I folded the sleeves up 2 3/4 inches and made cuffs. 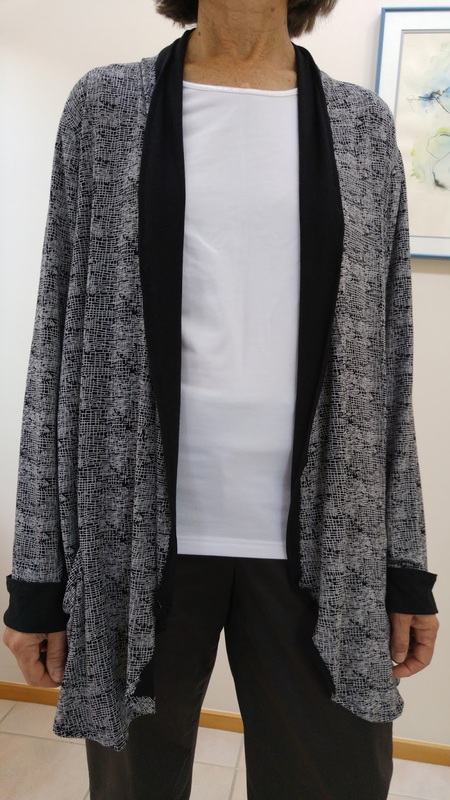 I did this by cutting off >1/2 of the back SA, folding the front SA over it and topstitching for the bottom 5 1/2 inches of the sleeve seam. I then pinked the hem edge, folded it over towards the right/print side, then pressed and topstitched it. Then I folded up the cuff and tacked it. For the bottom edge, I cut off 2 1/2 inches at the back increasing to 4 1/2 inches off at the front. Then rather then just pinking the front and bottom edges, I folded them over to the inside along the bottom edge to approximately where the front edge starts to roll and then tapered to no fold and folded in the opposite direction for the front edges. It turned out fairly well and isn't too obvious where I transitioned. I don't think I'll make this pattern again though. I always seem to be fussing with where the collar and front edges fold. It might have worked better in a slightly heavier, less stretchy fabric. The pattern called for 'Fleece, Sweatshirt Fleece, Jerseys, Cotton Knits, Interlock, Sweater Knits'.